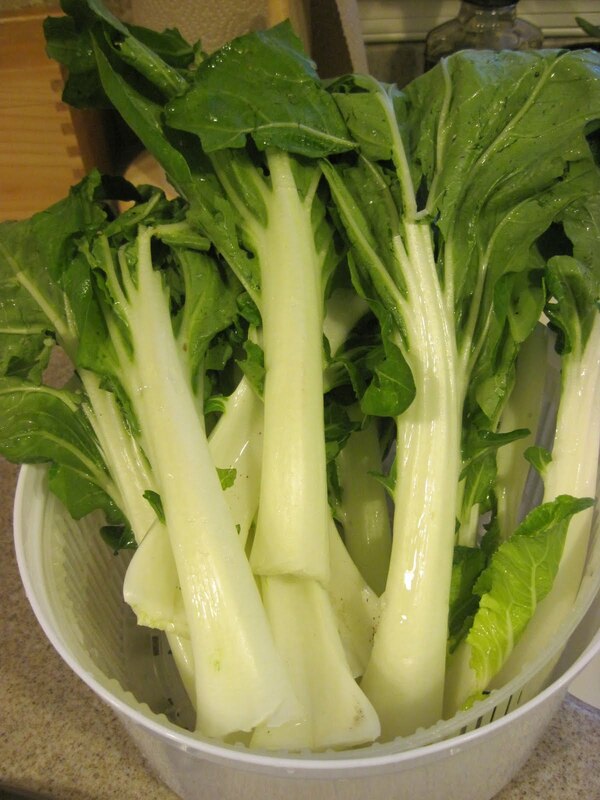 Another new vegetable to me - bok choy! We received a whole head of it in our CSA share this week. My husband wanted sushi the other night, so I thought doing some sort of Asian-themed recipe with the bok choy would be a nice pairing. Heat the sesame and coconut oils in a large skillet or wok over medium-high heat. In a medium bowl, stir together the water, ginger, garlic, oyster sauce, soy sauce and honey. Set this aside. Add the bok choy stems first; stir fry for a few minutes or until the pieces start to turn a pale green. When stems are almost cooked, add the leaves; cook and stir until leaves are wilted, 1 to 2 minutes. Remove from the heat and transfer the bok choy to a serving dish. Pour the sauce into the skillet or wok (watch out for splattering and steam when you add the sauce to the hot pan), and set over medium-high heat. Cook, stirring constantly, until sauce has thickened slightly, about 2 minutes. Pour over the bok choy and toss lightly to coat.